When we launched a video meme maker five months ago, we named the website “Kapwing,” the sound of a bullet ricocheting off of metal. The word “kapwing” is an onomatopoeia, and you pronounce it with emphasis on the “pwing” (here’s us saying it on YouTube). 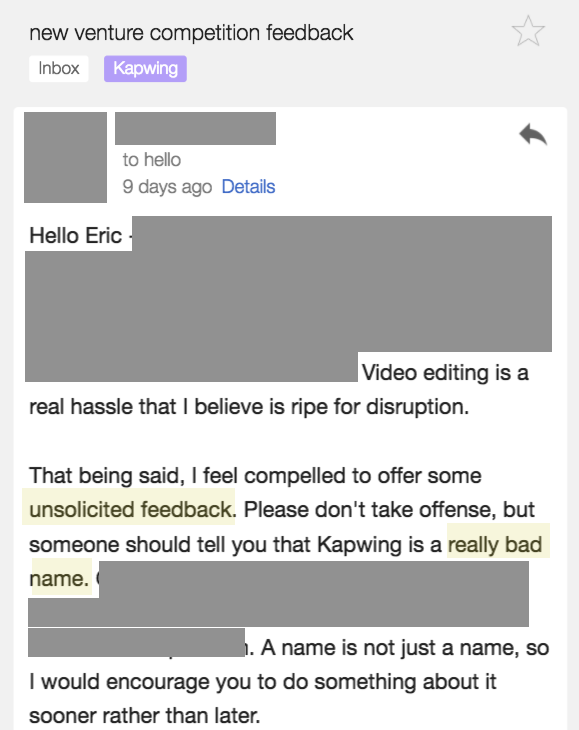 Now that Kapwing has blossomed in to a profitable video editing suite, we’ve gotten some questions about the name and some advice that we should change it. In this post, I’ll share what we considered when naming our tech startup and some takeaways for founders seeking names. It’s fun to say: Who doesn’t love onomatopoeia? The delicious “pw” ring rolls off the tongue. It’s silly and a bit weird: The video formats you make on Kapwing are funny, authentic, casual, and young. We want our company brand to be as wacky and zesty as its name. We’re a website for artists, kids, influencers, and creatives, not straight-laced 50-year-olds. It’s (pretty) easy to spell: Once you know that the first letter is a “K” instead of a “C”, it’s spelled just as it sounds. It’s memorable: The name is sticky because the “pwing” sound is unusual. It’s easy to tie the name to a visual and auditory reference, which improves recall. It sets us apart from our competitors: Most video editors have boring literal names like Windows Movie Maker, iMovie, and After Effects. The newer startups in the video editing space still have tame, film-centric names like Animoto, ClipChamp, or InShot. We want to clear the outfield, so we like having a name that can carry a new identity, a name that’s really different than the tools and platforms that exist today. The meaning: Like videos, you can hear and see a Kapwing. It’s a verb and a noun. It’s the sound of a pivot, of something changing directions, of something hitting its target and leaving its mark. It implies momentum, resilience, energy, strength, and lightning speed, all key values at our company. The origins: The word “kapwing” was used (and possibly invented) by Bill Watterson in his comic Calvin and Hobbes. We love Calvin and Hobbes and admire the imagination of their creator. By mixing text and visual media, Watterson was, in a way, an original meme maker, a clever creative to inspire all the people who come to Kapwing to caption videos. It’s difficult to pronounce: Many people we meet think it’s pronounced “kap-wing” and are suprised when they hear us say the name out loud. It’s often the first thing we talk about in meetings and presentations. Of course we don’t really care which way our users pronounce it, so it’s annoying to have to discuss something that doesn’t matter that much. Some people are put off by the silliness: It’s not a professional name, and that might frighten some executives off. It doesn’t communicate the function: Unlike “Windows Movie Maker,” people who hear about Kapwing do not automatically know what it does. That’s probably an obstacle for word-of-mouth growth. There is rarely a perfect name: We just haven’t been able to fall in love with any other name. The alternatives that we have come up with seem lame on comparable criteria, and there are tradeoffs to every decision in Startup Land. Domain names are expensive: We had some ideas for other names, but many of our candidates are already trademarked or owned by other companies. The domain “Kapwing.com” is affordable at only $10/year, and affordability is a high-priority for a self-funded company. Once you start with a name, it’s hard to switch: All of our growth so far has been through SEO, and we’re already ranking high for high volume queries like “meme maker” and “resize video.” Changing the name of our website would require migrating to a new domain, and since Google’s algorithms depend primarily on links from other sites we would start from square one in terms of our Search ranking. That’s a big risk when we need revenue to pay our own living expenses. A name doesn’t matter that much in consumer SaaS: I love the name Kapwing, and some advisors and investors really don’t. But I’ve never had an actual user tells us the liked or disliked the name of our tool. It seems like every business person I talk to has an opinion about the name, but I’ve gotten tens of thousands of messages from users and not a single one has expressed love or hate for the name. “Kapwing” merely seems to do the job, and that’s fine with me. Thanks for reading! Keep following the Kapwing blog as Eric and I fight to keep growing our user base and building the best video editor on the web.